I lost my job two days before my birthday, in July. I mourned while floating around in five inches of water in a Disney princess inflatable pool, fueled by beer and self-pity. On a whim I bought a flight to Halifax to crash with my friend for a few weeks. There were no jobs, why not look elsewhere? I had barely seen my own corner of Canada. As a form of consolation, my good friend Doug offered me a free night’s stay at the upscale Des Barres Manor in Guysborough, a rural part of Nova Scotia I had never been. A girl like me loves pretending to be classy. My friend Cailin and I left bright and early on a Tuesday morning, taking the scenic route along the east coast. We paused at Martinique Beach, dipped our toes into the Atlantic and saluted the clear sky. On the road, rural Nova Scotia crept up on us. Signs apparently placed at random by the side of the road announcing “CLUBHOUSE SANDWICH” and “FRIED PEPPERONI” eventually led us to a tiny take-out joint, closed for the season. We peered into the antique shop next door, searching for treasure. I really wanted the fried pepperoni; Cailin wanted the vintage Ronald McDonald poster. We kept veering off course. After five hours being in the car, we became giddy and delusional. Our GPS kept lying to us, and we drifted onto unpaved roads. We took a sunny stroll along Tor Bay Beach, tossing sand into the air and whirling under the prospect of a three-course meal awaiting us at the end of the journey. Eventually, we made it. 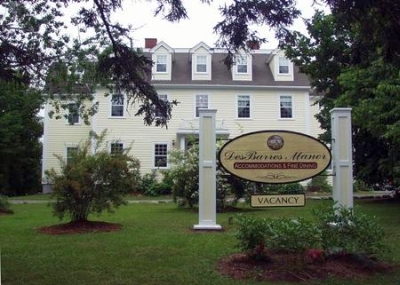 The Des Barres Manor is a fully restored, historical B&B erected in 1837 for Supreme Court Justice W.F. DesBarres. It stands out among the other homes, a sharp monarch, set on a sprawling lawn and fitted with a large deck. As soon as you enter the front door, you take in the sheer amount of space. Every detail is meant to impress. The floral wallpaper, the framed antique maps, the oak furniture. DesBarres liked to indulge. Supper was at 6 p.m., we had time to kill. I found my room, squealed over its size and made a mental note to pocket the shampoo and body wash. Then I rolled around on the bed, stroked the antique typewriter, and struck a pose in the mirror. It was like a preparation ritual. My old life felt far behind. Our supper was paired with wine, which suited us just fine. We had tomato bisque with an old-fashioned dumpling and dry wine, followed by grilled salmon with mango compote, garlic roasted fingerlings and veggies, paired with rose wine. I still don’t know what most of those descriptions mean. For dessert, there was banana bread pudding, and more wine. I even ate the flowers which garnished our dishes. I’m told they were edible. The wine left us a little tipsy. We wandered into the parlor, a cozy space filled with more floral designs, bright chandeliers and, my favorite, a fully stocked bar. We bought beers and played a round of board games. Our only company was an elderly couple who quietly observed our Tic-Tac-Toe turned drinking game, while Cailin and I shook fists at each other and cursed under our breaths. When I showed up at the kitchen with an ice bucket for our beers, the hostess quietly took the bucket from my hand and replaced it with a much bigger one. I appreciate good customer service. I went back to my room and made a pillow and blanket fort, spread out my limbs in the 600-thread-count sheets and considered spending my lifesavings on a set from the gift shop. I slept better than I had in years, waking before breakfast to go for a run. The morning was perfect, Chedebucto Bay was still and blue. People standing by the side of the road chatted to their friends in vehicles. I dodged vicious dogs and wheezed my way up a hill. At the Osprey Shores Golf Resort, an oceanfront resort, we went off-roading in some golf carts. I don’t play golf, I can’t wrap my head around the “tees” and the clubs and the culture. We carefully avoided other players and strolled along the beach instead, parked our cart at the dock in Mussel Cove to soak up some sun. The remains of summer freedom, the healing of the open road. Somewhere between expensive bed sheets and edible flowers, I stopped mourning. 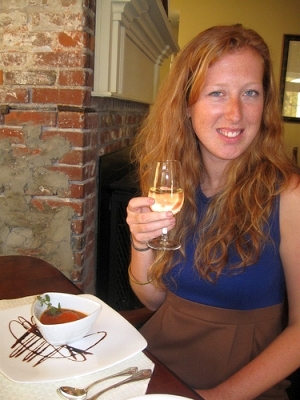 Candice is a travel writer and blogger currently stationed in St. John’s, Newfoundland. When she’s not shooting whiskey and hitting on men, she’s eating nachos and dreaming about her next big adventure. Check out her blog, Candice Does the World.